This novel is as bleak and scouring as the dust storms which fill its pages. Set in a near-future America, Above All Men follows the life of former army medic David Parrish, his wife, Helene, and their adolescent son, Samuel. After a vague but disastrous international war, the Midwest has returned to its farming roots amid a decaying America. The situation is dire and getting worse. There’s an ongoing drought, and soon a storm in the Gulf knocks out our protagonist’s last source of oil. In its first half, Above All Men chronicles the day-to-day struggles of David and his family as they deal with a world that seems intent on snuffing out human life. Halfway through, his friend’s little girl is murdered, and David quickly becomes unhinged in his quest for justice. Tormented by his actions in the war, David seems decent, if emotionally stunted, and it’s easy to buy into his plight as a troubled man trying to do right by his family. Once the murder takes place, though, the novel heads down a dark hole from which it never fully emerges. David’s actions in pursuit of justice are increasingly violent, all hung entirely on little more than a hunch. By the final pages, despite the terrible repercussions of his actions, it’s not clear that David has actually learned anything. Yet it is hard not to admire Above All Men. It is stark, compelling, and impossible to ignore. Shonkwiler’s prose rises and falls in poetic fashion; he has an excellent grasp of rhythm. The resource-starved future presented here is rich and believable, providing a tense environment within which to explore the struggles of this family. Themes of death, loss, and struggle pervade the work; it opens with young Samuel’s first exposure to death and ends with his becoming entirely too familiar with it. Above All Men is at its best when it presents simply a slice of life, letting its focus wander to capture moments of drama. After the murder, this exploration is jettisoned, and the novel becomes laser-focused on moral absolutism, frontier justice, and David’s obsessive quest to find the killer. Unfortunately, the first half does not lay out villains or motivations adequately for the second half, and the result is an unexpected murder plot which sometimes feels contrived. 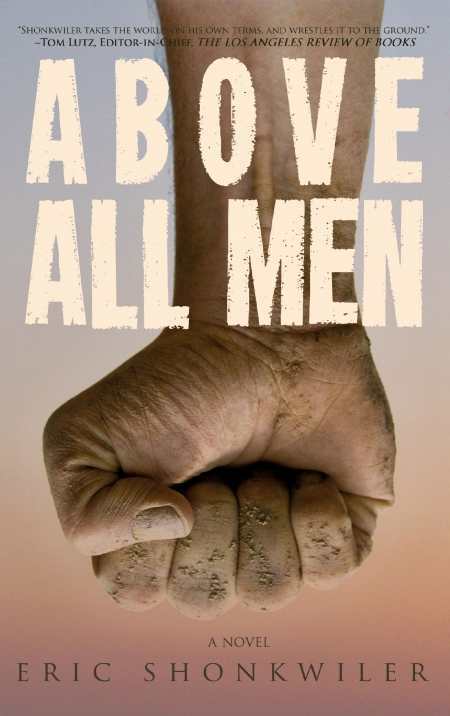 Though it has the trappings of a near-future cowboy thriller, Above All Men has a literary heart which should have broad appeal to those with an interest in fiction.